Duplicate content has long been a concern for marketers looking to improve their Google rankings, but now Twitter has announced new restrictions on how users may automate tweets as well. Users can no longer tweet the same content from multiple accounts, but can only tweet from one account and have other accounts retweet it, and must avoid bulk tweeting or tweeting that is aggressive or high volume. The new policy applies both to duplicate tweets sent at once or scheduled in advance. Apps are still allowed to post content from other platforms to Twitter, but can only do so to one account. These changes underscore how duplicate content has become an issue for companies that use multiple platforms to distribute marketing material. Here are some keys to avoid running into duplicate content issues when doing cross-platform marketing. Google defines duplicate content as significant content chunks distributed across one or multiple websites that either totally copy other content or significantly resemble it. Twitter’s new rules similarly define duplicate tweets as being either identical or essentially similar. Google draws a distinction between duplicate content that is malicious versus non-malicious. Google sees malicious duplicate content as designed to game search engine results or generate higher traffic by copying the same content on more than one page or site. Tactics Google considers malicious include scraping content, auto-generating content, duplicating content that has already been published on another page or site, link schemes, use of irrelevant keywords, hiding text, and sneaky redirects. Google sees this type of malicious duplicate content as distinct from non-malicious duplicate content that has a legitimate purpose. For example, some sites have different versions for mobile and desktop readers. Some news sites and blogs provide a printer-only version of their site that includes an entire article on one page without ads. E-commerce sites may post multiple URLs that lead to the same product page. Google and other search engines such as Yahoo and Bing handle malicious duplicate content differently than non-malicious content. When Google reviews a report about malicious duplicate content, Google’s reviewers may demote the content, remove it, or take other actions. Upon taking action, Google sends a notice to the site’s webmaster, who is then given an opportunity to fix the problem and submit a reconsideration request. Twitter appears to be following a similar procedure. Google takes a different approach to duplicate content deemed non-malicious. An estimated 25 to 30 percent of content is actually duplicate, which is normal and does not draw a penalty from Google. But if Google’s robots detect multiple versions of the same content on a site or on different sites, they must still determine which one to prioritize when listing search results. They do this by following an algorithm that compares different versions of the content, indexes the first version crawled, and removes other versions from results listings. Other search engines use a similar practice to filter results. Presumably Twitter will take a similar approach. You can avoid most duplicate content issues by following best practices. Most fundamentally, avoid any SEO tactics that Google, Twitter, or other platforms define as malicious, as elaborated above. If your receive a duplicate content notice, instruct your webmaster to take appropriate measures to fix it so you can submit a request for reconsideration. For non-malicious content, focus on developing original content. If you use content from other sites, include something extra that adds unique value, such as your own commentary or a top 10 listing. If you have product descriptions, instead of borrowing the manufacturer’s description as most sites do, modify descriptions to make them unique to you. If you syndicate some of your content to other platforms, publish it on your own platform first so that you get indexed first. For content that is featured on multiple places on your site, you can tell search engines not to index secondary versions by using your robots.txt file. For blogs, select your settings to avoid indexing archives for dates and categories. For pages that have been moved from their original URL, use 301 redirects to let search engines know which version to index. If you host product pages on multiple platforms, you should use ecommerce product page best practices to avoid duplicate content issues. Create unique versions of your landing pages and product pages instead of using the same version everywhere. To save time logging into each of your online profiles, use a content management platform that allows you to manage all your online properties from a single interface. A content management interface also makes it easier to track your content’s performance across multiple platforms so you can track and correct duplicate content issues. Knowing how search engines and social sites handle duplicate content can help you avoid running into issues. Following these guidelines for avoiding malicious content and managing non-malicious content will help you keep your online properties from getting flagged and keep you competitive in search engine results. While difficult to do and very important, offline spending and digital marketing need to get connected. CMO’s need this data to make the right calls on their marketing mix and shape their priorities. Datalogix connects offline consumer spending to digital marketing to help marketers increase the effectiveness and measurability of their advertising. It does this by aggregating and providing insights on over $2 trillion in consumer spending from 1,500 data partners across 110 million households to provide purchase-based targeting and drive more sales. They have over 650 customers, including 82 of the top 100 US advertisers such as Ford and Kraft, as well as 7 of the top 8 digital media publishers such as Facebook and Twitter use Datalogix to enhance their media. Oracle signed an agreement to acquire Datalogix. How Does Datalogix Fit Into The Oracle Cloud? Oracle and Datalogix’s Data as a Service cloud solutions will provide marketers and publishers with the richest understanding of consumers across both digital and traditional channels based on what they do, what they say, and what they buy. This will enable leading brands to personalize and measure every customer interaction and maximize the value of their digital marketing. The ideas of contextually relevant content and offers is finally coming into it’s own. Will this results in the brand promises so many CMO’s are trying to deliver on? The combination fundamentally transforms marketing automation from executing campaigns to being able to correctly identify consumers, target them accurately with digital campaigns, allow marketers to measure which campaigns and channels are effective, and optimize how they reach consumers and spend their campaign resources. The addition of Datalogix represents a further extension of Oracle’s Public Cloud strategy to combine IaaS, PaaS, SaaS and Data as a Service on a common cloud and to transform SaaS business applications and processes by integrating data within these applications. If CMO’s are going to be able to deliver right-time, real-time contextually relevant content, offers and conversations, then this type of data is critically important. However, the question always remains how tech savvy are the CMO’s? Many have been focused on creative most of their careers. Today’s CMO must become tech savvy or at least have a staff that is. What would help? IT. But there’s long been a struggle between IT and functional department priorities. With the advent of SaaS, many functional departments like marketing want to be able to stand up their own technology without being pushed to the end of the line of IT priorities. However, while SaaS allows marketers to do this, many of them might benefit by having a real partnership with IT, i.e., someone who is used to buying and implementing and optimizing technology. It will be interested to see how the relationships between IT vs. functional departments will pan out over the next year. Will they collaborate or will they remain at a standstill? Will leaders at the CXO office step in to stop the corporate politics or do they even know they exist? Today’s marketing technology landscape represents a whopping 947 different companies that provide software for marketers, focused on specific functions such as marketing automation, web data analysis or customer relationship management. What this means is that the job of the CMO and Marketer has become increasing complex. The other issue is that often the technology decisions in a company used to be made by IT are now being made by the line of business, or in this case in Marketing. With the role of IT changing, and Marketers choosing their own line-of-business technology themselves, this has shifted the overall landscape of how technology is chosen, implemented and maintained. Another issue is that not enough CEO’s really understanding the strategic value of marketing and analytics to the point that they themselves are engaged in the decision making process – i.e., choosing the right technology for their organization and / or using the information about their customers to transform their products and services. What’s really required as part of doing business in 2015 is a shift in the overall business’s business model to a more digitally transformed business where all levels of executives are involved in not only the selection but also the use of the data and analytics to make better business decisions. The Birst Marketing Analytics Accelerator simplifies this increasingly complex marketing landscape by bringing in data together from multiple data sources and embedding the insights into every marketing decision — all using a single platform. Birst provides marketing data readily available in user-ready formats so that marketers can intelligently navigate the customer journey. Marketers not only focus on nurturing new prospects, but also building loyalty and retention strategies. This means that they are not only responsible for acquiring customers, but also keeping them. However, leveraging data to be able to do all that has become increasingly complex with marketers drowning in a sea of technology solutions. 2015 will be the year that companies either make the decision to go forward with the digital transformation or be left behind. It’s a very important decision that should not be overlooked by CEO’s, CIOs, CTO’s, CFO’s and CMO’s as well as Customer Service Professionals. It may even mean that a whole new role, something like a Chief Digital Officer, is created for every brand and that is the person who pulls all the “old” various roles together to help them see how their role should transform as well as how the company or brand should shift their business model to a more digitally oriented business model, where customer data, at every touchpoint is used to make better business decisions. This requires that the senior leadership team recognize this need and step-up to the plate and make it happen within their organization. The world has gone digital, and no one feels the pressure more than the CMO. Customer segmentation presents challenges that are not possible to uncover with traditional methods. According to Forbes, “Gartner analyst Laura McLellan recently predicted that by 2017, CMOs will spend more on IT than their counterpart CIOs.” Those who don’t embrace analytics fully will lose their seat at the C-suite table. In this webinar, I will share my expertise on how CMOs can navigate the challenges of their evolving roles. Her marketing optimization framework enables assessment and evolution of marketing efforts as well as integration of analytics to improve bottom-line results. We’ll use a 5-level maturity capability matrix to show how you can progress your marketing capabilities. Christy Maver, Director of Product Marketing at Actian, will present a set of Customer Analytics Blueprints designed to give CMOs a roadmap to address big data marketing challenges. Reserve your seat to hear how Actian can help you accelerate Marketing analytics! 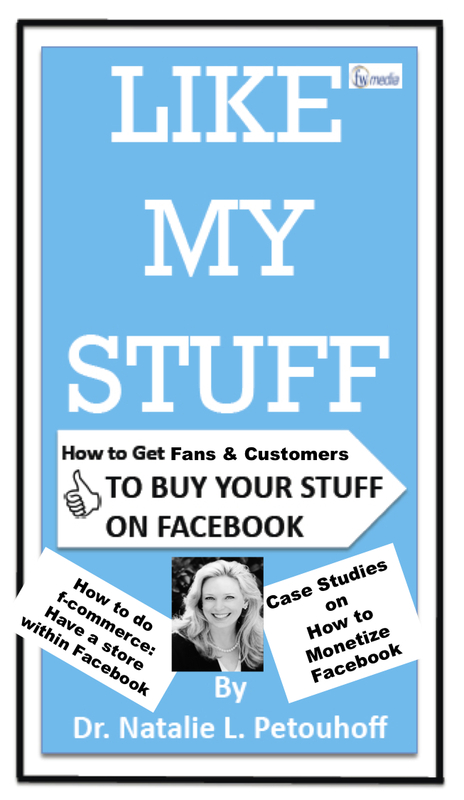 Excerpt from “Like My Stuff”: Why Do Business on Facebook? Why might Fauscette make this prediction? Facebook users spend 700 billion minutes per month in an active, relaxed environment. The average Facebook user is connected to 130 friends. They belong to 80 interest groups. Through their detailed profiles and by posting on average 90 pieces of content per month, Facebook users make their preferences known. Word-of-mouth (WOM) recommendations or buyer-beware messages are prevalent. Today’s social customer is not shy about posting their thoughts about a brand, its products and services, or the experiences they have with the brand. The unique selling opportunities Facebook can offer has gotten the attention of digital marketer’s and PR professionals. As social media plays an increasingly more important role in purchasing decisions, brands are allocating larger parts of their marketing budgets to engage with their consumers on platforms like Facebook and Twitter. Many brands, big and small, are wondering if they should go down this path. How is this different than the e-commerce they already offer? And does f-commerce mean that you have to get rid of your traditional e-commerce platform? Are there pitfalls to social commerce or commerce on Facebook? It’s these and other questions we will address in this e-book. For many brands, Facebook is where their customers are online. And the mantra in social media? A brand needs to be where their customers are within the social net. A brand can’t expect that their customers will come to them (or their site.) The theory of f-commerce is that customers should be able to buy wherever and whenever they like. If they are on Facebook then they should be able, among many other things, to purchase products while they interact with their friends and family. Some people have questioned whether it’s even possible to sell customer products in the midst of them using Facebook to catch up with their friends and family. Perhaps that’s all people want to do while on Facebook, i.e., they don’t want their social network to sell them stuff while they are socializing. And if that is the case, then perhaps brands should keep their commerce offerings on their e-commerce sites. However, while some people are of the opinion that people visit Facebook just to catch up with their friends and family, a JWT (James Walter Thompson) study showed that 48 percent of millennials (aged 20–33) would like to buy directly on Facebook from the places they shop. In a another study industry study, 25 percent of customers aged 18–34 years old stated they use Facebook to interact with merchants. How many companies are planning to increase their funding for social commerce according to this study? Ninety percent will increase funding for social commerce initiatives by 8 percent. There is a trend, and that trend is the blending of social networks with e-commerce. The skill with which brands do this will directly affect the success not only for their own individual brand, but for the industry as a whole. If social networking shopping sites are not delivered in the spirit of what the customer wants, it will fail. If not for this point alone, brands need to pay attention to f-commerce as an example of how shopping can be integrated within a social network. So let’s say you have a vacation coming up. You want to look for good rates on airline tickets. What’s the difference between logging onto an airline website vs. being able to research and purchase tickets inside of an already established social network? First, you may want to ask your friends what airline they flew on, how the service and food was, and what to watch out for. You might find that information on a travel site, but you may not be able to ask your friends their opinions. So the point is that when you are on a regular e-commerce site you may be just getting the “take” from people you don’t actually know. This input is important, because you aren’t just trusting the brand’s marketing spin. You are getting the take of other human beings. But on a social networking site you are connected to your friends and your friends know you and the things you care about the most. You also might want to make plans with a group of people and instead of sending a bunch of e-mails, you might want one place for everyone who is going on the trip to chime in, to plan, and to orchestrate the festivities. Doing so could make coordinating lots of people easier and fuel the enthusiasm for the trip. If you went the traditional route, you’d think about which airline you think you’d like to travel on. You might also think about your favorite travel site, knowing that there are a number of them that aggregate fares and try to provide the best possible deal. So you make your choice and log onto the airline or travel website. Hopefully you’ve saved your log-in name on the computer you are on or you can remember it. It might depend on whether you’ve been to that site before or not. That might also depend on whether you have an account with them or not. If you can’t remember your log-in name then you have to either ask for a password reset or log in as a guest. The first option takes time. Not a lot of time, but it can “feel” like a hassle with all the sites and passwords we all have these days. Once you’ve chosen that path, then you start your search for dates and times for your destination. Once you’ve researched that, you choose a flight and pay for it. Then there’s the step of entering the payment information. That entails your credit card or PayPal-type account information, your billing address and TSA information. If you are renting a hotel and/or a car, that same payment scenario might have to be repeated for each of those transactions unless it’s integrated. In this short scenario, using Facebook could help to lessen the hassles of the travel transactions. With Facebook’s f-commerce tools, you could get the opinion of your friends about each travel item: airline, hotel, car rental, even restaurants in the area. Then you could just hit a Facebook button for each—either while on your laptop, desktop, tablet, or phone and be on your way. Why? Because you are already logged into Facebook, and so have a community of like-minded people to help. Then, since your identity and payment details are already authenticated within Facebook, completing the transaction is as simple as pushing a few appropriate buttons. If your business could take advantage of f-commerce to make your customer’s experience as quick and easy as possible, think about the spike in revenue you’d get. The business decision to use Facebook as part of your e-commerce strategy depends on where you think your customers are going to be online. With more potential consumers on Facebook than there are people logging into eBay and Amazon combined, many companies are betting on the fact that once customers are in Facebook they won’t want to leave to shop. With the number of sites people log into each day, this may well be the trend of the future—meaning that people are starting to suffer from social network fatigue. The reasons for this fatigue include how time consuming it is to log into a bunch of different sites as well as to remember your passwords. Another contributing factor is time allocation. One of the things that most people don’t talk about is the amount of time out of their life social networking takes. While it may be easier to keep in touch with more people and see what is happening with them via Facebook, Twitter, Google+, and LinkedIn, it does takes time out of one’s day. Having too many social networks means that people may not want to go to a bunch of different sites or URLs. If people have the choice to log into one place to interact with their friends and family and then are required to go to other places to shop, they may opt to participate in a social network that includes not only their favorite brands, but also the ability to buy products and services from them. Knowing who the people are and details about them allows Facebook to provide customers with an interesting and entertaining online experience, but also provides businesses with information on likes, dislikes, and preferences in the context of their personal and professional relationships. This is different than the data businesses have gathered from traditional Customer Relationship Management or CRM systems. CRM is an acronym that stands for the relationships companies build with their customers during and through the process of marketing, sales, and service. Having social data augment the CRM system could constitute what many call social CRM. While there isn’t any one vendor that truly provides best-in-class social sales, social marketing, and social customer service all in one suite, the concept of combining social data with traditional CRM data could be the missing link to driving more customers through the marketing funnel and getting a return on investment for social media. Social networking sites like Facebook have massive amounts of individual and social crowd data. That data means something because people have signed up using their real identity. In forums or other crowd-oriented communities, people sometimes remain anonymous. So one of the first advantages of f-commerce is that people are using their real identities. In addition, Facebook started as a site to connect with other people and part of finding people to connect with is to see what they have in common other people. Most people who put up a Facebook page include some personal preference information. This initial data can be very important to companies in understanding their customer’s behavior through knowing about their hobbies, what they like in music, food, travel, and a wide variety of other interests. Companies using Facebook as a marketplace not only have people who have identified themselves, but also user data and analytics that reveals what people talk about, and with the right analytics a business could extract even more data about them as potential customers. Many businesses have just focused on using that data to display hyper-targeted ads. And while there is value for this, the idea that Facebook could be an online virtual mall where friends ask friends what to buy, share what they bought, and thereby influence word of mouth is a reality for many brands. One-to-one marketing has long been the dream of many marketers. In fact two of my favorite authors, Don Peppers and Martha Rogers, wrote several books about it, including The One-to-One Future: Building Relationships One Customer at a Time, and The One-to-One Fieldbook: The Complete Toolkit for Implementing a 1-to-1 Marketing Program. The theory was that with competition for customers fiercer than ever, with products and services only a mouse click away, with so many choices, and with many products becoming commodities, customers’ loyalty changed. As a result, the way a brand could attract and keep customers would be to personalize how they marketed and sold to a customer. That field of endeavor became known as one-to-one marketing. While most brands bragged about how customer-centric they were, in reality many were at a loss for identifying and attracting a loyal and profitable customer base. CRM (Customer Relationship Management) systems back in the late 1990s were supposed to provide the infrastructure necessary to support one-to-one marketing. There was a lot of marketing hype around the features, functions, and benefits of CRM software. The issue with CRM systems then was that they were more like a CTM, or customer transaction management system. They didn’t have all the rational database information that marketers could readily use to provide personalized relationship marketing and certainly not enough of the personalized, one-to-one marketing data. Most companies implemented operational CRM, meaning they had a database of contact information about their customers. And that information definitely helped with marketing. But most companies didn’t deploy analytical CRM, meaning the type of CRM that would provide the analytical wisdom about your customers to enable one-to-one marketing and sales. Out of the frustration for the lack of that data developed the field of business intelligence or BI. Separate BI point vendors began to specialize in gathering and mining data about customers to be used to drive customers through the marketing funnel. An industry that was successful at this was the Las Vegas casino system. They developed loyalty programs that could measure the offers sent to customers and subsequent behaviors. Studying these patterns allowed marketers to direct their one-to-one marketing efforts very effectively. But most industries failed to excel in one-to-one marketing. Fast forward to today, where we now have Web 2.0-type technologies that allow interactions between brands and customers. With the enhanced Facebook Open Graph API and supporting tools that it announced in April 2010, Facebook can be seen as a social CRM system. This is especially true if you define CRM as the opportunity to do personalized, one-to-one marketing, sales, and service. What has been missing in CRM is the relationship between the customer, their likes, dislikes, and their friends and family in a context where their reactions and comments are honest, authentic, and updated daily. Facebook offers businesses a way to connect to that information via an API. An API is an acronym for application programming interface. Instead of having to write a bunch of complicated code to connect to the data, you just have to connect to the API. The API provides a much simpler way to access the information. The Facebook Open Graph API allows you to easily access all public information about a person. This means that it can retrieve the likes and interests of your customers, and your customer’s Facebook connections. And thus the social graph data provides marketers new ways to understand a customer’s preferences, passions, and connections and by doing so allows a brand to create a personalized experience with each and every customer. For instance, a customer might live in Los Angeles, listen to Sting, work at Citibank, ride bikes along the Santa Monica Pier, eat at the Cheesecake Factory in Marina Del Rey as well as connect with their network of friends and family. With the Facebook Open Graph API, brands can make personalized offers to that individual based on the information he or she has shared on their page. Deals that might interest this customer are mortgages or refinancing information from Citibank, coupons for free drinks at Cheesecake factory, a sale on bikes or bike accessories, and a special appearance by Sting on the Santa Monica Pier. With contextualized data like this, brands can customize their marketing campaigns based on the information customers share about themselves. Another example is that a brand might show the upcoming birthdays of Facebook Friends as well as their gift Wish List. How would a brand populate this list? The brand can access that friend’s profile data, which might include a list of their favorite electronics, clothes, food, and music as gift suggestions. Normally, it would have to create a system that would ask the customer directly about their favorite items, then get permission to use this information. The Social Plug-ins, mentioned earlier in this chapter, allow a brand to build the social graph by seeing what the customer “Liked” on Facebook. That is assuming the customer opts to share this information publicly among their own individual group of friends. Brands seeking to use this information would need to ask the Facebook member to share this information with them as well. The downfall to getting data is the individual Facebook privacy setting. Each Facebook page’s privacy settings are handled and decided upon by the customer who owns the page. Customers are asked to provide permission to allow their page to be seen by the brand. This determines who can see what. I’ve included some screenshots in the case studies in the following chapters so you can see how brands ask for permission to see what a customer is talking about. On the Mobile Commerce – What People Browse, Buy and Why?